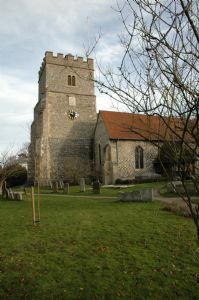 Holy Trinity Church is believed to date back about 1000 years. 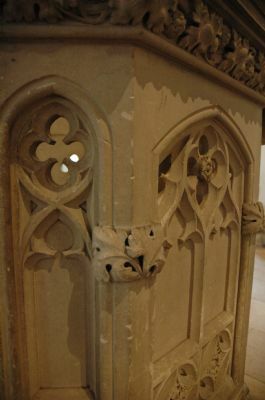 It is suggested that in the wall behind the altar there exists some traces of Saxon masonry. The Normans were considerable church builders and, whatever might have existed in Cookham before then, a stone church, easily recognisable as ours, was in being by about 1140. 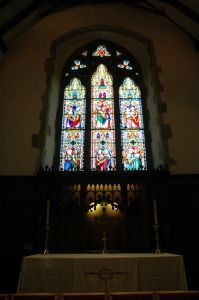 Its Sanctuary was where the high altar is; a stone Nave provided the centre of the long slim church in which we worship, but initially there weren’t any side extensions. In the wall opposite the door, to the left of the corner, there is still the shape of a Norman window, with its curved arched top. In the early 13th Century St Catherine’s chapel was added – this now houses the organ pipes and the vestry. The chapel was extended in stages to form the Lady Chapel by about 1215. It is thought to be about 1270 when the Norman wall to the south of the nave was pierced, and the arches and columns which stand there today were put in place. Beyond them the South Aisle was built. About 30 years later St Clement’s Chapel was added in the south east corner. On the south wall, a couple of recesses were created for tombs that may never have been put there, and a door was made and later blocked up. With this enlargement of the church, the faithful of Cookham came to worship in a building that has remained almost unchanged for more than 700 years. One of Cookham's most famous son's was, world famous artist, Sir Stanley Spencer (born 30/6/1891 – died 14/12/1959). Much of his greatest work depicts biblical scenes, from miracles to Crucifixion happening not in the Holy Land but in Cookham, where he was born and spent most of his life. Spencer believed that the divine rested in all creation. He saw his home town of Cookham as a paradise in which everything is invested with mystical significance. "The Resurrection". Christ is enthroned in the church porch, cradling three babies, with God the Father standing behind. Spencer himself appears near the centre, naked, leaning against a grave stone; his fiancée Hilda lies sleeping in a bed of ivy. At the top left, risen souls are transported to Heaven in the pleasure steamers that then ploughed the Thames. He referred to Cookham as "a village in Heaven" fellow-villagers frequently stand in for their Gospel counterparts, lending Christian teachings an eerie immediacy.